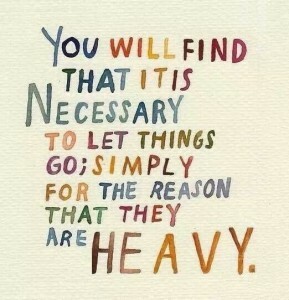 Let Go And Encourage Change! Is there a personal pattern of behavior or a negative attribute that you desire to change? Here is a “letting go” ritual that may help you to facilitate the release and the change. Take some time to engage in a writing activity. Begin by writing down on a sheet of paper what you want to change. Really take some time with this. If you are so inclined, use special ink that helps you to feel creative and connected to the paper. Next, on another piece of paper, write down what letting go of the behavior or attribute would look like. How will you look, feel, and interact with others after you have released this behavior? Be specific. What will your “new self” look like? Now, take both papers and plan a brief excursion. It may be a simple walk to a favorite place in nature, or it may be a one-hour drive to a special area. On the way there, allow yourself to really focus on how the negative behavior has limited you. Allow yourself to feel the pain and/or fear that is associated with it. Likewise, if the “curse” has also been a blessing, honor that. When you arrive at your destination, get comfortable. Take out the two pieces of paper. First read the paper that lists the behaviors or attributes you wish to release and feel the words in your heart. Take your time with this. Now tear the paper into small parts, and then either burn it or wet it so that you witness the transformation of the paper and the words. Feel in your heart the releasing energetically of the old. Next look at the paper that reflects what you want to bring into your life. With determination and conscious intent, sign this sheet as a commitment to change and place it carefully in an envelope that you will keep in a special place. On your return ride home, feel the lightness of your changed self.